alaTest has collected and analyzed 410 reviews of Trust SpotLight Webcam. The average rating for this product is 4.0/5, compared to an average rating of 4.0/5 for other products in the same category for all reviews. People are impressed by the size and design. The usability and price are also mentioned favorably. We analyzed user and expert ratings, product age and more factors. Compared to other products in the same category the Trust SpotLight Webcam is awarded an overall alaScore™ of 84/100 = Very good quality. 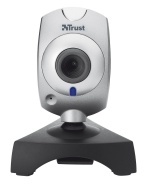 alaTest has collected and analyzed 25 user reviews of Trust SpotLight Webcam from Amazon.co.uk. The average user rating for this product is 4.0/5, compared to an average user rating of 4.0/5 for other products in the same category on Amazon.co.uk. Reviewers are impressed by the design. The usability also gets good feedback. Easy set up, and good focus, very clear picture and sound, but the lights are useless. They dazzle when in use, but I turn them off and use a desk light. You really do need a light or the picture is fuzzy. All in all good value for money. Neat camera but perhaps what I expected for the price. I have a logitech one on a monitor which is of much better quality and only wanted this new one for my laptop which has no camera. It will suffice. I bought this webcam to work with Skype as my (very) old USB camera wouldn't work with Windows 7 x64. the webcam is worth the money.the lights on the webcam are not very good.just a gimmick.a good starter webcam. Minimum system requirements:Windows Vista or XP. USB port (USB 2.0 recommended).